8K resolution, or 8K UHD, is the current highest ultra high definition television (UHDTV) resolution in digital television and digital cinematography. 8K refers to the horizontal resolution of 7,680 pixels, forming the total image dimensions of (7680×4320), otherwise known as 4320p. Apple, Windows, Sharp (electronics maker ) all renewed its support for 8K resolution. That is to say, 8K ultra HD display is coming, not just for TV, but also for desktop computers, laptops, and even for smart phones! Then I wanna ask is your media player ready to date this advanced 8K display technology? Do you know what's the best 8K Player? This article will offer you a best 8K Player for playing discs and common media files. You might have been recommended some players like VLC Player, KM Player, Media Player Classic already. But if you are seeking a professional yet powerful 8K Player, Brorsoft Video Player for Mac (Windows) is your first choice. It is an all-in-one solution for 8K/5K/4K videos playback in various formats including MP4, MKV, HEVC, AVI, AVC, MOV, M2TS, MOD, FLV etc. What's more, it is also regarded as one of the best Blu-ray players on the market which widely supports Blu-ray/DVD disc released in different region. With its advanced editing features like screen recording, GIF output, users can create their own masterpiece during the playback. 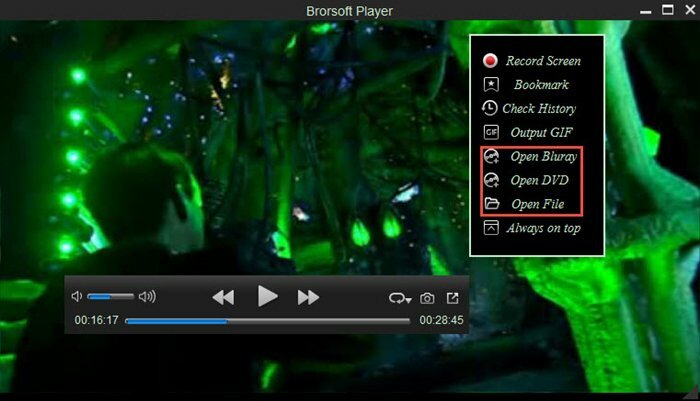 Download and run the best 8K Player on computer and click "Open File", "Open Bluray" or "Open DVD" button to load media files for playback. That's all. Much simple!